The Ramkhamhaeng Inscription, aka Sukhothai Inscription One, was found in 1833 by Prince Mongkut, the future King Rama IV, while he was still a monk. He found it in the area where most historians assume that the royal palace once stood. 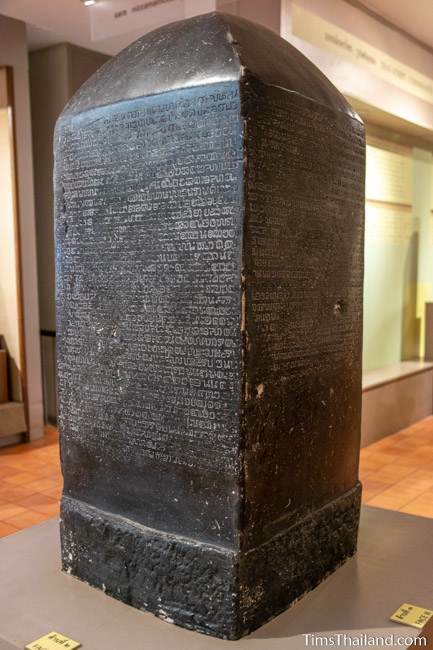 The inscription is a squat four-sided pillar rather than the typical slab shape and is 114.5cm tall with each side 35.5cm wide. The first and second sides have 35 lines each, the third and fourth each have 27. It’s in rather good physical condition with clearly legible text except for a few small areas where some letters have vanished or are indistinct. The inscription is dated 1292 and provides some of the earliest historical information about Sukhothai, though as it lacks contemporary sources for comparison, the specific information is not considered completely reliable. The inscription says it was made for the occasion of setting up a stone throne for King Ramkhamhaeng (r. 1279-1298, Sukhothai’s third king) amidst a sugar palm grove that the king had previously planted when he first became king. It sets out to exalt the king and his kingdom and proclaims that Sukhothai was prosperous, treated all (including outsiders) equally, offered people freedom, and was a devoutly religious place. There are three parts. The first (lines 1-18 on the first side) gives the king’s personal background, and this is the only section with the personal pronoun “I.” The second (from line 18 on the first side to line 11 on the fourth side) discusses the physical, political, and social aspects of the city. The third (lines 11-27 on the fourth side), glorifies the king. Different spellings and tone over the course of the text show that it was probably written over a fairly long time by different scribes before being tasked to an engraver, and the last part was probably written after Ramkhamhaeng’s death. The Ramkhamhaeng Inscription is also important because it’s the earliest surviving example of writing in a Tai script. It adapted the Khmer script, adding more consonants and vowels to facilitate Thai sounds and tones. It bears only some resemblance to the modern Thai script and native Thai-speakers trying to read it can only make out scattered words. According to the inscription, King Ramkhamhaeng himself invented this script in 1283. Some historians, both Thai and foreigner, have proclaimed the Ramkhamhaeng Inscription not genuine. (This is a topic of discussion best avoided with Thai people in most circumstances.) Their theory is that King Rama IV faked it to promote his modern reformist policies by giving them some historical precedence. Most historians, however, including David K. Wyatt and Charles F. Keyes, do accept it as a document from the lifetime of King Ramkhamhaeng. Here are the four main reasons that skeptics consider the Ramkhamhaeng Inscription possibly fake, followed by critical responses. 1. It is unlike all other known inscriptions of that era. / It was done for an unusual event by an unusual king. 2. Some of the letters differ from those in later inscriptions and seem more similar to modern Thai than the later inscriptions. / The script was new, so there is no reason to assume it wouldn’t change. 3. It does not represent how people probably would have spoken the Sukhothai language, in particular the tone marks. / The spoken language of that era is dead, so we can’t know if it is right or not. 4. The stories don’t fit the real history. / The known history of that early period is quite limited. 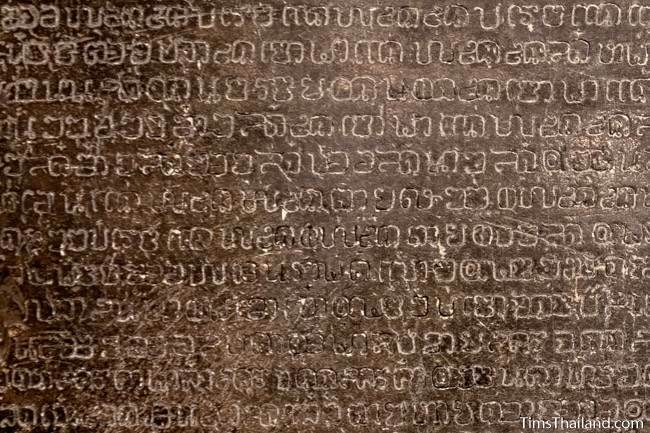 The translation of the Ramkhamhaeng Inscription, which was begun by King Rama IV himself, to both modern Thai and other languages took decades and even today there are still many words that cannot (and probably never will) be known for certain. 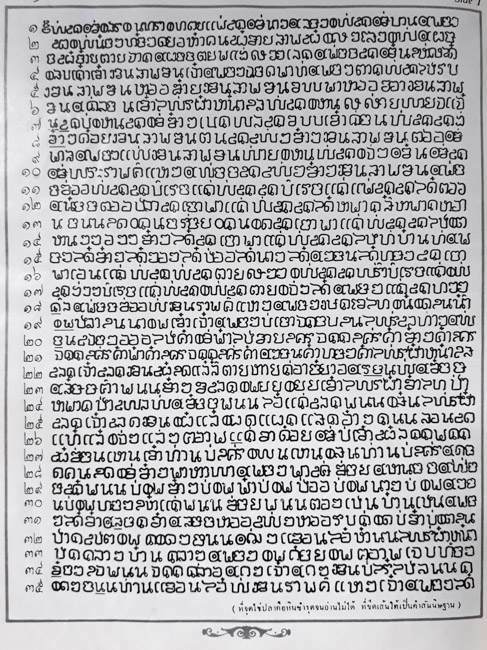 For a more in-depth discussion of the Ramkhamhaeng Inscription than I can give, I recommend “The Inscription of King Rama Gamhen of Sukhodaya (1292 A.D.), Epigraphic and Historical Studies No. 9” by A.B. Griswold and Prasert na Nagara, published in the Journal of the Siam Society in 1971. Most of this article (whoever scanned it skipped several pages) is available online. The Center for Southeast Asian Studies at Northern Illinois University has a webpage showing the inscription in both the original script and modern Thai.